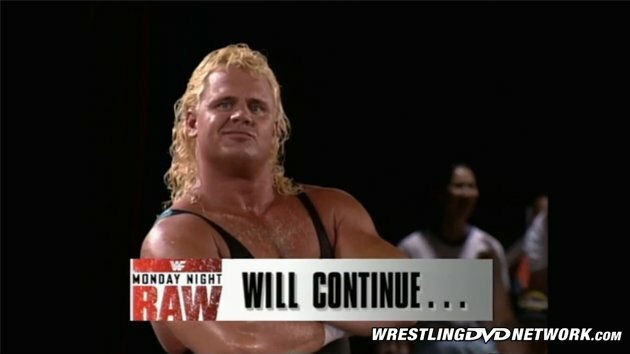 This week Throwback Thursday dips into the archives of the WWE Network to revisit a classic edition of WWF Monday Night RAW that happened 25 years ago today! The summer of 1993 was a down time for the World Wrestling Federation and the business writ large. Behind the scenes Vince McMahon was facing a serious federal investigation regarding McMahon’s role in the distribution and use of anabolic steroids in the WWF that would eventually lead to an indictment in November of ’93. If that weren’t bad enough a sluggish economy in the late 1980s spawned a recession that reduced the buying power of tens of millions of Americans and affected the entire entertainment industry, particularly professional wrestling, which was already weakened thanks to the “Golden Era” bubble bursting around the same time. As a result the Federation was in a state of transition. Not only had Vince McMahon resigned as President of Titan Sports (in name only) but Hulk Hogan, the WWF’s biggest star, was on his way out following the European tour in August ’93. Though the WWF was looking to feature younger, more athletic wrestlers as top stars (Bret Hart, Shawn Michaels, Razor Ramon, etc.) and get away from the muscled-up babyfaces and the tired formulas attached to it, old habits die hard. Enter the infamous “Lex Luger experiment” in which Lex Luger, a former star of the rival World Championship Wrestling, would be positioned as the WWF’s next Hulk Hogan. With the push for SummerSlam ’93 in full swing the Luger/Yokozuna story was about to become the focal point of everything World Wrestling Federation. But how well does this edition of RAW hold up 25 years later? Let’s hit ‘play’ and find out! Edits are few and far between, for those keeping score, and context is nearly complete with all prior editions of Monday Night RAW and all previous PPVs currently available on the Network for you to enjoy right now. The syndicated TV of the day, Superstars and Wrestling Challenge, as well as USA Network’s All American Wrestling, are currently not available on the Network. 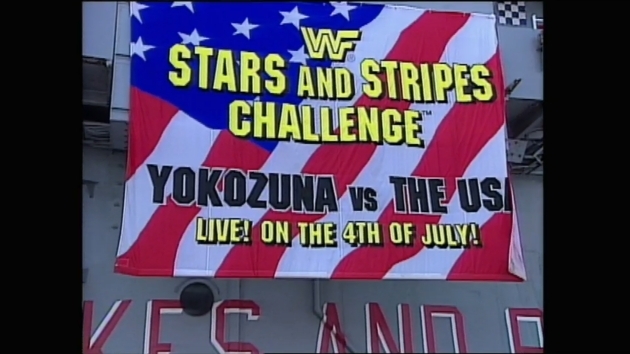 The show opens with preview footage of the July 4th “Bodyslam Challenge” aboard the U.S.S. Intrepid at Pier 86 on the Hudson River in Manhattan. We see one person after another, wrestlers and pro athletes alike, try and fail to slam World Heavyweight Champion Yokozuna. We get the great, original Monday Night RAW show open next followed by Vince McMahon welcoming us to the show and talking about the “Bodyslam Challenge” aboard the U.S.S. Intrepid from yesterday. Next we go to the actual challenge aboard the U.S.S. Intrepid. The winner gets a brand new Chevy Silverado pickup truck! Lee Rouson, the recently retired running back for the New York Giants and Cleveland Brown, sings the national anthem. If you thought you were listening to Cuba Gooding, Sr., you wouldn’t be far off. We see one athlete after another, including Rouson, Bob Backlund, Pittsburgh Penguin Peter Taglianetti, Scott Burrell of the Charlotte Hornets, World Tag Team Champion Scott Steiner, Tatanka, former Atlanta Falcon Bill Fralic, Crush, and “Macho Man” Randy Savage try and fail (or in the case Scott Burrell, walk away) to slam the 550-pound Yokozuna, an “embarrassment to America” according to Vince McMahon. The contest appears to be over when a helicopter arrives and Lex Luger, wearing red, white, and blue, walks to the ring, receiving a mixed reception to say the least. Luger pushes past Bobby Heenan, gets in the ring, calls Fuji a “cancer in the World Wrestling Federation”, and calls Yokozuna “an overstuffed, sushi-eating, rice-choppin’ wrestler”. 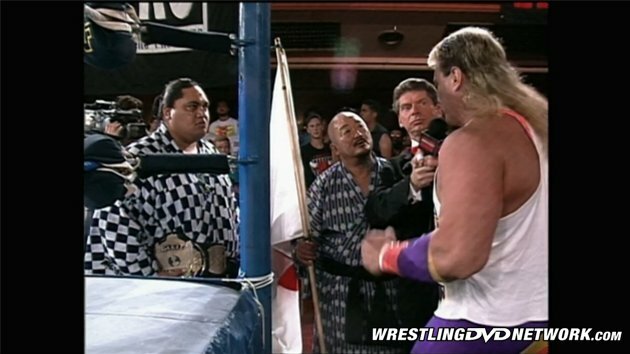 Luger tosses Fuji from the ring and prepares for his attempt to slam Yokozuna. At last Yokozuna charges Luger, who sidesteps the Champion, and Yoko goes face-first into the turnbuckle. A dazed Yokozuna turns, walks into Luger’s forearm, and is body slammed as the crowd goes crazy. Luger celebrates on the shoulders of the Steiner Brothers with a flag in each hand as the segment ends. Blake Beverly had been working solo since his partner, Wayne “Beau” Bloom, retired at the end of April ’93. 1-2-3 Kid, meanwhile (sans eyebrows), was in the midst of a major upswing since defeating Razor Ramon on the May 17, 1993 edition of RAW. This is a great showcase for the Kid who displays one impressive move after another, popping the crowd and commentators alike. Bloom takes over and thrashes Kid in and around the ringside area which allows Kid the opportunity to do some great Ricky Morton-esque selling. Eventually Beverly misses a splash from the second rope which allows Kid to hit a guillotine leg drop from the top for 1-2-3 at 8:02. Up next is the first Monday Night RAW vignette for Men on a Mission (Mable, Oscar and Mo). This is followed by an IcoPro and old school WWF action figure spots. We go to the back where Luna Vachon stands with Bam Bam Bigelow, calling Bigelow “the most dominant force in the World Wrestling Federation”. Squash city here! Bigelow runs over Maggs and hits a pair of avalanche splashes to score the pin at :42-seconds. The match is so quick that Heenan can barley spit out his Bigelow/Tatanka story! Next we see a promo for USA Network’s All American Wrestling and the “Mean” Gene/”Brain” road trip across America. At the announce position Heenan gives a few details of the upcoming SummerSlam ’93 PPV while McMahon sells All American Wrestling as the place to get the latest news on the event. This marked Undertaker’s first non-highlight match on RAW since defeating Skinner on the February 2, 1993 edition of RAW. Undertaker hadn’t been seen since the June 12, 1993 edition of Superstars when, after defeating P.J. Walker, Undertaker and manager Paul Bearer were attacked by Mr. Hughes and Giant Gonzalez, who not only beat the snort out of Undertaker and Bearer but stole their urn as well. 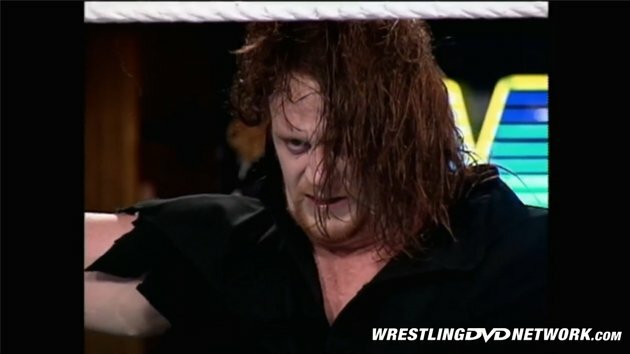 There’s a botched leap frog early but Undertaker simply walks through it, no-sells it, and carries on like a true pro. 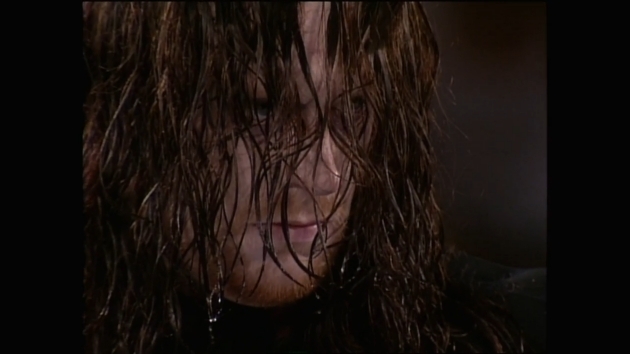 The story here is Undertaker seemingly being lost or a step off his game due to the absence of Paul Bearer and the urn. Samu manages to beat the bejabbers out of Undertaker in and out of the ring and, with Undertaker unable to sit up, looks to have the match won with a diving headbutt. When Samu goes for a second flying headbutt rather than the pin Undertaker sits up, chokeslams Samu, and ends the match with the tombstone piledriver at 7:25. Next up is a goofy WWF Mania promo starring Todd Pettengill. This brings out Crush, who thanks Lex Luger before taking Mr. Fuji up on the “open contract” to face Yokozuna. Fuji tries to take back the challenge but Yokozuna overrules Fuji and agrees to face Crush next week. Fuji says Crush will lose face in Hawaii while Crush says he’s proud to be from Hawaii and even more proud to be an American. A SummerSlam ’93 promo airs next while back at the announce position McMahon, Savage, and Heenan shout about Crush challenging for the World title next week. Prior to the match Mr. Perfect strings his chewing gum around the glasses of one of the RAW Girls who looks less than enthused. As for the match, it’s a squash. Perfect lands a beautiful dropkick, chops the hair off Costello’s chest, and ends things with the Perfect-Plex to score the win at 1:01. After a break we see one final slow-motion replay of Luger slamming Yokozuna to end the show. Surprisingly the show and the matches, including the squashes, hold up extremely well in 2018. This is simple, compelling storytelling from start to finish that works, proving that even in the down times the WWF is as good as it gets. Besides, any show with 1-2-3 Kid, Bam Bam Bigelow, Undertaker, and Mr. Perfect on it is a winner in my book. If you’ve never seen this it’s well worth your time and if you have it’s worth another look. Already subscribed to the WWE Network? Then you can relive this classic edition of RAW right now or see it for the very first time! As always, let us know what you think in the comments. Watch every episode of RAW’s 25-year history as part of more than 10,000 hours of content on the WWE Network. Your first month is FREE! Click here to subscribe to the WWE Network. When Luger arrive in the helicopter, the crowd chanting HOGAN, HOGAN, HOGAN!!! That was muted on this episode of RAW. But today they put the integrality of the bodyslam challenge on the WWE Network and that part is not mute! Hello Nicolas Hebert! It did seem like WWF was building to Hulk slamming Yoko when Luger showed up in the chopper. I remember watching this in real time, this RAW I mean, and being disappointed it was Lex. Very odd time for the company. Thanks for reading Nicolas Hebert and taking the time to leave your comments! Take care! Haha, simpler times in wrestling! Not sure why Vince thought the viewer would care if they won that. Jesus, imagine sayin’ that nowadays? ‘The Narc-racist’ Lex Luger. Hello RabidHeat! I agree in respect to the dialogue. I don’t have a problem with it, it’s a work, but I can imagine heads exploding in 2018 if anybody on WWE said that kind of thing. Simpler times indeed! In respect to the pickup truck I got a laugh knowing full well Luger never even sniffed the new car smell of that thing. Closest Luger got to that truck was walking past it to get to the ring! Thanks for reading RabidHeat and taking the time to leave your thoughts! Haha! I know, I don’t find it particularly offensive either as I grew up during that time and it comes across more funny than anything, but it’s all at once weight-ist (if that’s even a word) AND racist, lol. And I think the most bizarre thing about it is it comes across as more of a heel comment, whereas the intention was to get Lex over as the new top babyface (suppose it was just labelled ‘patriotism’ back then to mock another culture). Re: the pickup truck, I find it to be similar to when TNA do the Joker’s Wild tournament and the prize is $100,000. Storyline-wise, why should I care about that? It’s great for the wrestler, but it doesn’t impact at all on future storylines; no title shot earned or anything. Thanks for the review though; in a way it’s more interesting to have these Raw episodes reviewed as opposed to the PPVs as these are the hidden treasures! The PPVs I tend to remember well enough anyway. Just like WWF did in 98 with the winner getting the SCSA 3:16 pickup truck except the winner was a fan, not anyone from the company. Same with the million dollar contest from Summerslam 97 which I honestly found hilariously cheesy that no one in person or by phone calls could guess it but then that guy announced it on the mic as a so obvious answer when he said “three” and Sable or Sunny got key 3 and unlocked the chest easily. Like to me it was 3 obviously bc of the company’s 3 initials, WWF. Felt it was staged. Wondered where and/or who that million ended up going to. Also wondered how Sable & Sunny worked through that w/the heat they (reportedly) had if true. Anyway along with some ridiculous match stipulation (Pillman wearing a dress & Bulldog eating a can of dog food of they lost) some matches had, this segment was the only downside of an otherwise enjoyable ppv w/the match of the night for me being Taker vs Bret. Austin vs Owen would’ve tied w/it had it not been for the accident to Austin. It’s not racist considering Yokozuna was actually Samoan in real life. It is Mike Enos that was Blake Beverly. Beau was Wayne Bloom. 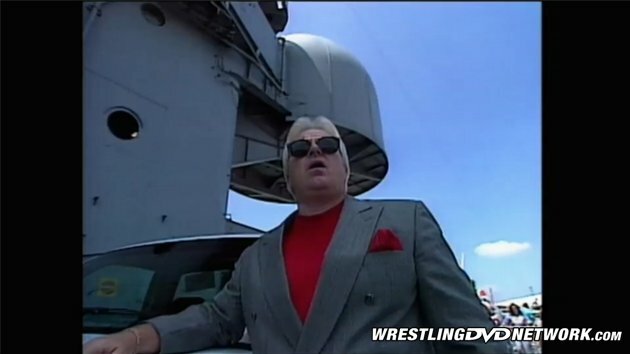 Hello Wrestlevessel! That was a typo on my part. Thought I was typing “Blake” and “Bloom” popped out. Thanks for reading Wrestlevessel and taking the time to leave your thoughts! Have a good one!